Joseph the Dreamer was the first of two sons born to Jacob and Rachel. He had 10 half-brothers, and 1 half-sister. 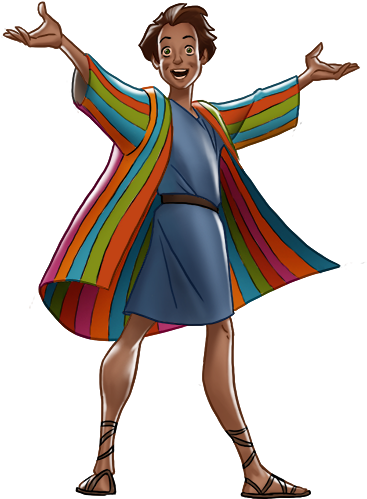 As a young boy of seventeen, Joseph was hated by his brothers because he made a report to his father of his brothers’ misdeeds, and Jacob showed his favoritism by giving him a “coat of many colors”. At that age of seventeen, Joseph interpreted two of his own dreams. In the first, Joseph and his brothers collected bundles of grain, of which those bundles belonging to his brothers bowed to his own. In the second, the sun, the moon, and 11 stars bowed to Joseph. These dreams only provoked his brothers. One day, Joseph’s father sent him to look for his brothers who were out in the fields tending their flocks and when they saw him coming, they plotted to kill him, except for Reuben who suggested throwing him into a pit, intending to rescue Joseph after. Unaware of Reuben’s true intention, they obeyed him. However, some Ishmaelite merchants were passing and the brothers sold Joseph to the passing merchants for 20 pieces of silver. Reuben did not know this as he had planned to rescue Joseph later. The brothers dipped Joseph’s coat in goat’s blood to show their father, Jacob, that Joseph was dead. Meanwhile, the merchants sold Joseph as a slave to a wealthy and high-ranking Egyptian named Potiphar. Despite such adversity, God blessed Joseph, as he was appointed head of Potiphar’s household. Joseph was strong and handsome, and after some time, Potiphar’s wife became attracted to him. She tried to seduce him on numerous occasions, but Joseph rejected her all the time because of his loyalty to God and Potiphar. When her efforts failed, she accused Joseph of seducing her, making Potiphar angry enough to have him imprisoned. While in prison, Joseph interpreted the dreams of two of his fellow prisoners, a cupbearer and a baker, which came true. One of the men who was later released was asked by Joseph the Dreamer to remember him once back in Pharaoh’s service. After two years, Pharaoh himself had a series of disturbing dreams, and Joseph was referred to Pharaoh by the reinstated cupbearer. Joseph was brought before Pharaoh and interpreted his dream, where seven sickly cows consumed seven healthy cows, and seven sickly ears of grain consumed seven lush ears of grain. Joseph predicted that there would be seven years of bountiful harvests followed by seven years of famine in Egypt, and advised the pharaoh to begin storing grain for the coming famine. This earned Joseph favor from Pharaoh, and so then Joseph was made ruler of Egypt, second to only to Pharaoh. The famine that Joseph predicted also affected his father Jacob’s family, and this brought his brothers to Egypt. Upon discovering that his brothers were in Egypt, after they had years earlier sold him to the merchants, Joseph was much older and not easily recognized by his brothers. Joseph accused them of being spies and sought to have them bring his younger brother Benjamin to him, which seemed an impossible request, especially to Reuben. Joseph locked up Simeon and ordered his brothers to bring Benjamin to him in exchange for Simeon’s freedom. Despite Jacob’s reluctance, the brothers brought Benjamin to Joseph the Dreamer and only after a series of events did he reveal himself to his brothers. He forgave them and brought the entire family to Egypt. Joseph died at the age of 110. His last request to his brethren was for his bones to be taken with them to the land the Lord had promised to Abraham, Isaac and Jacob when the Israelites left Egypt. It is stated in Exodus that Moses carried Joseph’s bones all the way to Israel.